It’s September, and the changes of the season are setting in. If you have kids in school, then new teachers, schedules, and extracurriculars may be taxing your time. If you don’t have kids, there’s still more traffic on the road and people out and about. It’s not just the leaves and the latte flavors that change this time of year. September overwhelm is a real thing, and adjusting to all the new things on your schedule can be taxing on you and your business. Acknowledge it. You may be trying to manage your time better. You may be working to train a new virtual assistant. You may be fielding more calls as everything revs up again after a lazy(ish) summer. All of that can be a major stressor! But it’s important that, after acknowledging it, you take some time in the busy-ness now to invest in the rest of your year. Instead of reacting to all that is new, a smart leader will take a bit of time to focus on the long-term. It’s when we have the LEAST amount of time to think about the future that it pays off the most to do so. And you’ll find that, when you look around at things in the holiday season that will be here all-too-soon, you’ll thank yourself. In fact, we are pretty sure that if you invest just a bit of time now in a few areas, Future You, let’s call him/her December You, will be quite grateful. Here are five things December You will say to September You if you take care of a few things now. What’s the first thing to go when we get busy? Healthy eating, meal prep, and cooking at home. We drop those so quickly just at the time we need it most. The workouts, the plans to run, the morning walks all tend to get dropped to make time for whatever urgent thing someone else is telling you needs doing. And sleep? Who has time for that?!? Yes, self-care is a thing that seems like it can be dropped. But it’s precisely in timese like these that self-care is most vital. We get our car prepped for a taxing road trip, why don’t we prep our bodies for these trying times in the same way? Humans are naturally resistant to change. We like things to stay the same, so much so that we cling to old ways that are no longer sustainable or that even serve our purposes anymore. We hang on to old clothes, to old routines, even to old habits. But there is a freedom that comes from saying “Things have changed, and I will too.” Whether that’s adjusting your schedule in a way that serves both your business and your family life, or realizing a certain practice that used to work, no longer does, letting go and moving forward can be invigorating and beneficial. Picture Future You and what they will say when they see you’ve adopted a new way of keeping your books, or a new piece of technology, or something else that has made your business sharper, better. Won’t that merit a big “Thank You” come December? Outsourcing is a very personal decision. What will make one person’s life easier may not make another person’s life any better at all. But none of us can do it all, and the sooner we realize that, the better. So then the decision becomes, what can I outsource that will make life easier? If September You decides to outsource your email and phone responses, will December You be less stressed out? Will they be glowing because their new VA has returned calls and emails so fast that you booked new business off of those response times? 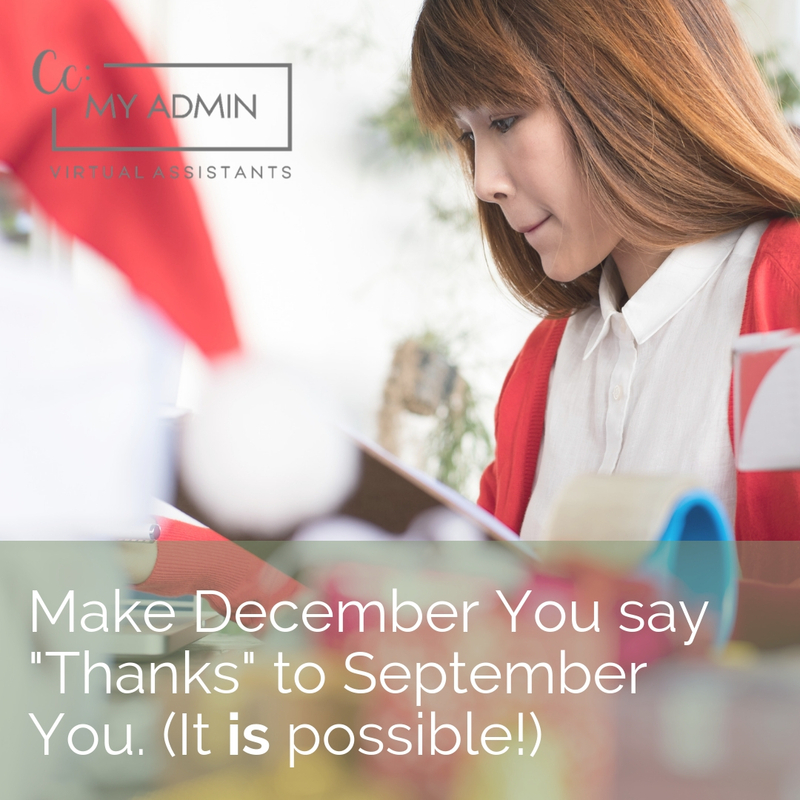 If September You decides that it’s time to stop muddling through the bookkeeping tasks each month, will December You be relieved? Less stressed knowing end-of-year tax tasks are wrapped up and put to bed? How does September You feel about social media? Hating it? Then think about how relieved December You will be if that task is not only off their plate but also thriving because someone else has taken care of it? “Thank you,” December You is saying, if you’ll just get it started now. Maybe you’ve already made the leap to outsourcing but your new VA is still scrambling on some tasks that you just haven’t quite had the time to explain. Managing people can be difficult, especially if you’re used to going it alone. But really, what are you waiting for? Make the most of your investment! We all know that explaining something well early on will lead to less frustration later; it’s just difficult to implement when your time is stretched thin. But if you help them and they master that one thing, then guess what? They can move on to another task that you need taken off your plate. It’s a win-win for everyone. And when December You thinks about how much freer they are to enjoy the holidays, or when they realize they no longer pick up their phone while they’re at the game on Saturday, or when they remember a lovely Halloween or Thanksgiving spent NOT working, then we’re pretty sure they’ll thank you for that, too. Sometimes we just need to hear from someone who has been in our shoes that we aren’t alone and that we will make it through. Mentors are great for helping us devise plans, but they also serve an important role as a kind of companion and source of compassion. Future You will benefit from any of those things this fall. Some great piece of advice might have December You enjoying new success; September You just has to reach out and ask for it!